There are no traffic jams in the stratosphere, but that doesn’t mean air travel is always a breeze. Being corralled into a metal tube with 200 other crotchety passengers and having just enough legroom to ensure you’re going to get a blood clot makes flying a rather unsavory experience for many. Boom is an app that wants to make flights more fun for its users. I’m joking – Boom is a startup that’s making something miles above any app out there. Almost literally. Boom, currently working through the Y Combinator incubator program – they’re graduating from the Winter 2016 class – is making airplanes out of a 10,000 sq ft facility south of the Centennial Airport in Denver. The planes on which they’re working aren’t quite like the ones currently taking off from the nearby airport, though; Boom’s supersonic passenger plane will be capable of Mach 2.2 speeds (~1,451 mph), which means they’ll travel at more than double the speed of sound. That’s about 2.6 times the speed of the fastest commercial airliners today. Boom uses a combination of innovation and frugality to make those unlikely figures a reality. The engineers use a carbon-fiber composite – a material that has a strength-to-weight ratio 18 percent higher than aluminium – to underpin the plane’s architecture. This results in a much lighter plane, which is part of what makes the crazy speeds possible. Further contributing to its feather-esque weight is the fewer-than-usual seat count; Boom’s planes will have only 40 seats as opposed to the 100 seats Concords had. The planes are also designed to fly at 60,000 feet instead of the usual 36,000 feet – another reason it will be capable of unprecedented flight times. And the flight times definitely are unprecedented. 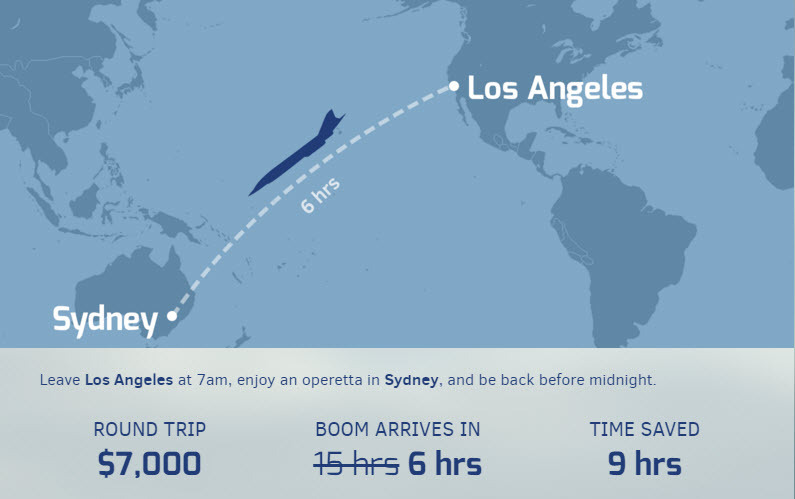 At Mach 2.2 speeds, a flight from New York to London lasts 3.4 hours instead of the usual 7 hours; Los Angeles to Sydney would take six hours, and not the expected 15 hours. The time savings come at a price, though. You’d have to drop $5,000 for a round-trip flight from NY to London on a Boom carrier; the round-trip LA-Sydney flight is priced $7,000. That’s a lot heavier than the usual bill, but the startup is primarily targeting high end business travelers, so demand shouldn’t be much of an issue, considering that first class flights from New York to London already run around $10K anyway. If you’re sold on hitching a ride on one of Boom’s screamers, you’re going to have to wait for a little while longer than the average flight delay; Boom is still working on their first prototype, and expects to have its first production vessels ready around 2017. 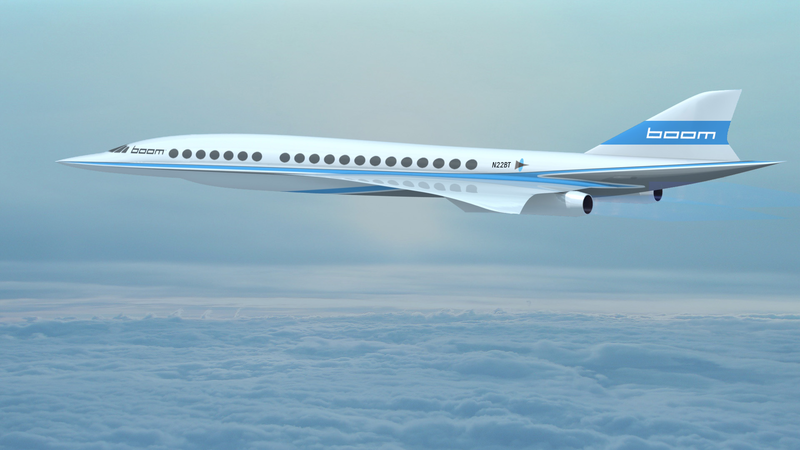 And you wouldn’t be the only one eagerly waiting for the supersonic airplanes to hit production. Virgin Group has evinced interest in Boom’s planes by optioning ten of them. Another European airline (that has been left unnamed) has optioned 15 planes. The two deals combined are projected to be valued at about $7 billion. In addition to Y Combinator, the startup has raised funds from Seraph Group and Sam Altman among others. With all that momentum behind them, you could say Boom is ready to take off. 10 planes!? Wow, and those contracts are huge in value. Very good for the company! Well, there has to be a certain level of safety that is involved with things going this fast, especially with the size of an airplane. I wonder how that has been addressed.